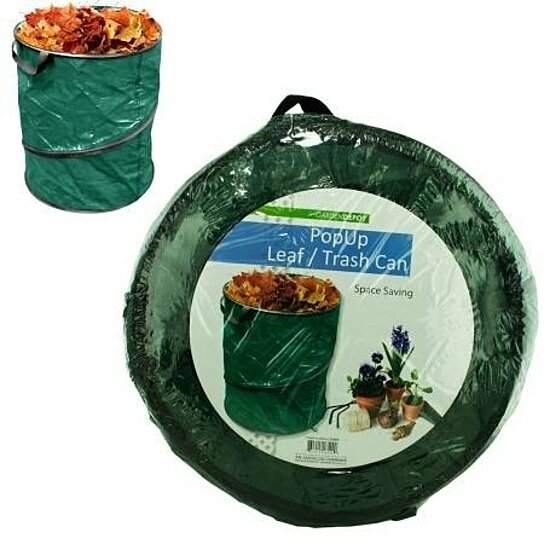 Great for keeping the yard clean and free of debris, this Pop Up Leaf Trash Can is a simple space saving solution! Can easily pops open for instant use and collapses down for convenient storage in garages or sheds. Use while raking leaves or picking up trash. Also stores easily in trunks, providing an easy way to hold trash during parties, while camping or at picnics. Trash can is made of durable woven plastic and has handles for easy transportation. Measures approximately 19" tall x 16" in diameter when fully expanded. Trash can comes packaged collapsed and shrink wrapped.